Through the magic of Social Networking (Twitter, Facebook, & Blog Comments) I have a mental list of folks who frequent this site that will be attending SolidWorks World next week. But I know that doesn’t include everyone who is a reader of this site. The purpose of this post is to try to reach out to ALL the folks in the SolidWorks Community who will be attending the conference next week with a simple roll call. 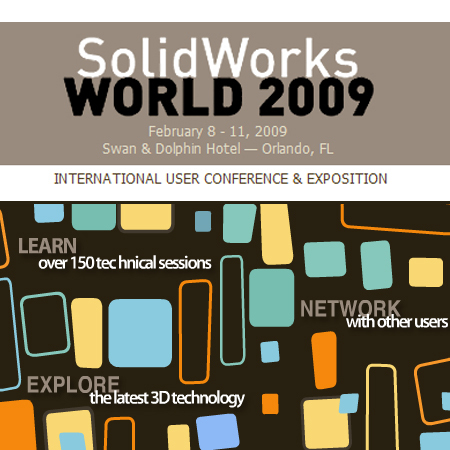 One of the great things about SolidWorks World is meeting new people so whether you already know me or have never corresponded with me before, leave a comment to this post if you are going and I’ll hope to see you there! My breakout session is Monday at 10:30am. You can read more about my presentation HERE. If you see me around the conference, PLEASE stop me and introduce yourself! As with every year at the conference, I look forward to seeing old friends and making new ones! Thanks for your response to my e-mail. I am going and I look forward to meeting you there. with the economy being as it is my company has been very tight with finances so this year I am going to miss the conference. Am planning on next year though! I will be there. We have never met, but I'm planning to look you up. My presentation is Tuesday at 4:30. Thanks for your blogs. I'll be there Friday night. See ya there. HI, This is Tony Cantrell and I'll be there.